Former Wigan, Birmingham and Juventus player Olivier Kapo is to join Neil Lennon's team until June 2012. Celtic are on the brink of signing former France international Olivier Kapo on a free transfer. 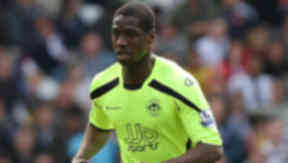 The left winger, freed by Wigan Athletic in the summer, will sign a contract until June 2012. Kapo hasn't played first team football since finishing the season with Boulogne and, with that in mind, Celtic have inserted an early termination clause in the player's contract, which can be exercised in January 2011. As he was released by Wigan before the end of the summer transfer window, Kapo will be eligible to play for his new club as soon as his registration is processed. Kapo started his career in France with Auxerre in 1999, before earning a move to Juventus in 2004. However, after failing to make an impact in his first season, the Ivorian went on loan to Monaco. A further loan spell at Levante followed before Birmingham City paid £3 million for his services in 2007. He was on the move a season later though, as Wigan Athletic ensured the Blues made a £500,000 profit when Steve Bruce, who signed him for Birmingham, took his former charge to the DW Stadium. 22 games and two goals later, Kapo went on loan in January to then French Ligue 1 club Boulogne until the end of the season. After they were relegated, Kapo returned to England and was subsequently freed by the Latics, after negotiating an early release from his contract. The 30-year-old, who was born in the Ivory Coast, has played nine times for France, with his last appearance coming in a 2004 friendly against Brazil. He was also involved in their Confederations Cup win in 2003, scoring the opening goal in a 5-0 group stage win over New Zealand. Kapo also scored in frierndlies against Egypt and Serbia and Montenegro.